Hi, crafty friends! Michelle here, back with a project using the “Tiki, I Love You!” box from the Fairytale Club! This time, I decided to make my first mini album! 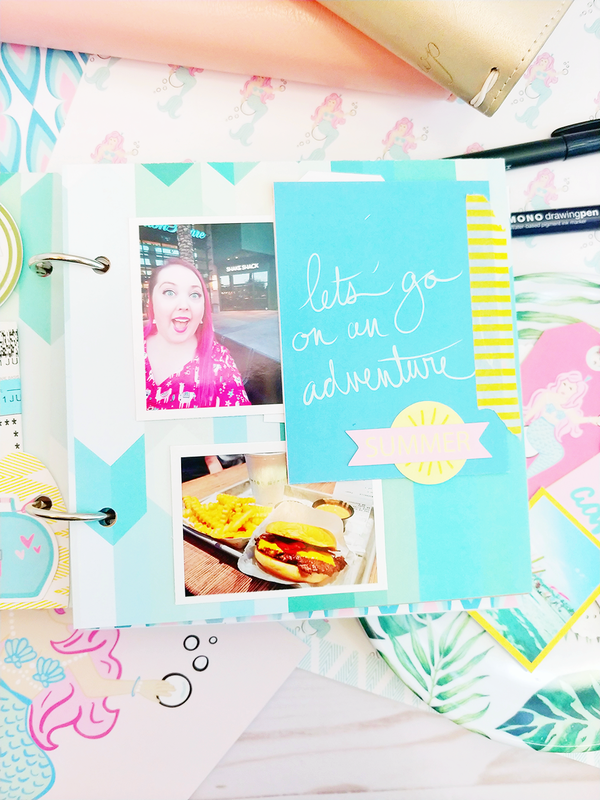 This collection of patterns and colors was just perfect to decorate an album filled with some of my favorite summer memories, so that’s what I did! My summer really got kicked off when I took a trip to Phoenix, Arizona. I spent some great time with my aunt, and we attended Plancation together! Plancation was an amazing planner conference where I attended some really helpful sessions of all kinds, made some great planner friends, and left with an awesome haul of new goodies! And of course, since the conference was a mere 15 minutes away from a Shake Shack, I had to go! We don’t have one where I live, and I don’t eat burgers that often. But when the world’s greatest burger is within driving distance, you go! And boy oh boy, I was not disappointed. I even tried their peanut butter burger! Sounds weird, but I highly recommend it. And of course, no summer album is complete without documentation of the cuteness that is my niece! I know I’m biased, but I really think she is the cutest baby ever! It is so fun to see her grow and learn new things every day. I remember not so long ago when she was my little cuddle buddy, but not anymore! These days, she wants to be up moving around and exploring the world around her. I love her and I am so excited to continue to watch her grow and be there along the way. I spend a lot of time inside working, but there was a day recently when I just had to get out! I reached out to my best friend, and we made a total day of it! We checked out a new brunch spot in town. Then we spent the afternoon driving around to other restaurants trying some “must haves” from a list we came across. And I finished off the evening at a baseball game! It was a perfect summer day. Recently my husband and I decided that we might be ready to buy our first house! After scouring websites of house listings, and coming up with a budget, we thought it might be fun to spend a day driving around and seeing what was out there! It was really fun and helpful! We were able to really see parts of town that we are interested in and get a better idea of what kinds of houses we like. This summer album was so fun to make, and it was really quick too! That is something that is so great about the subscription from The Fairytale Club. It is such a great selection of supplies and has everything you need! And since everything has already been put together for you, you don’t have to dig through all your supplies to find what you’re looking for. It’s all there, in one spot! Well, I hope you enjoyed my little summer adventure album! Happy Crafting!